The Grand Turk Cruise Center, with direct beachfront access, is a first-class facility nestled among nearly 14 acres of landscaped grounds. The cruise center's location and the island's geography offer vessels a safe approach and berthing year-round The short walk from the berthed ships to the cruise center (approximately 390 feet) allows guests ease of embarking and debarking at their leisure. The facility is owned and operated by Carnival Corp. Visitors to the cruise center have the opportunity to peruse through a 45,000 sq. ft. shopping center which includes a 10,000 sq. ft. Dufry duty-free shop, and 35,000 sq. ft. of high-end jewelry stores, an array of unique and world-renowned apparel and t-shirt stores, locally crafted souvenirs and gifts, and food and beverage facilities. Covering more than 14 acres, the Grand Turk Cruise Center can accommodate up to 7,000 passengers per day and features a private beach, swimming pool, and an expansive recreation area that includes a FlowRider® surfing adventure and the Caribbean's largest "Margaritaville"-themed bar and restaurant. Grand Turk Island is part of the Turks & Caicos Islands, a British Overseas Territory comprised of 40 islands and cays (pronounced keyes). This beach paradise has been blessed with crystal-clear, turquoise waters and smooth powder white beaches. Seven miles long and 1.5 miles wide, Grand Turk has served as the seat of government for the territory and the British Governor since 1766. The island is renowned for its inspiring and colorful British-Bermudian colonial architecture yet exudes its own quaint Caribbean charm. Located approximately 575 miles southeast of Miami, and 30 miles south of the Bahamas, Grand Turk enjoys a very comfortable climate year round due to a constant trade wind and averages 350 days of sunshine per year. Approximately 3,700 people call Grand Turk home. The Island is seven miles long and 1.5 miles wide. 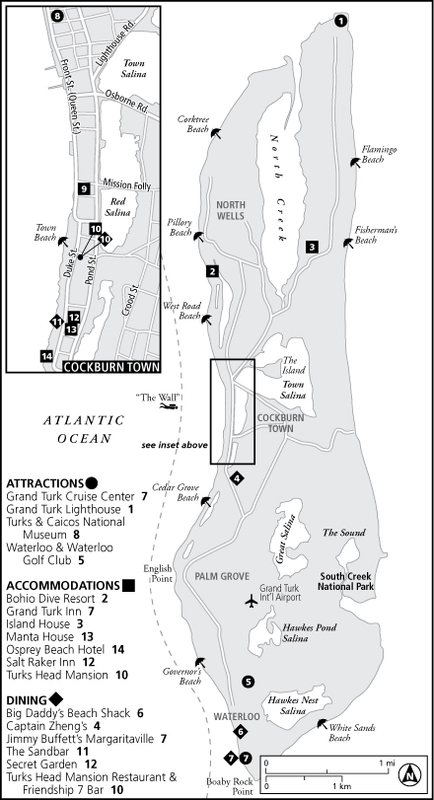 Grand Turk offers some of the Caribbean's most fascinating dive and snorkel sites and beaches. The island also offers a variety of other water and land-based excursions including trips to nearby islands and cays, some of which are inhabited by stingrays and the endangered Turks & Caicos rock iguana. The shallow banks surrounding the Turks islands are also a winter calving ground for humpback whales. Horseback ride and swim, horse and buggy trips, and world class sport fishing are also available. On land, the island offers unique points of interest including a historic lighthouse and natural salt basins that are home to a variety of wading birds. The historic downtown area of Cockburn Town features many homes built in the 18th, 19th, and 20th centuries; the national museum, an old prison, Columbus' alleged landing site and many pristine beaches including Governor's Beach. New: The FlowRider, open to all passengers coming off ships at this increasingly popular Atlantic Cruise Port, is a surf simulator that forms a "wave" by shooting a steady stream of water over a cushioned surface, creating a layer of agua that can be glided across ("surfed" on). You can either lie prone, a la boogie boarding (anyone can do it) or stand up in the traditional surfing style (if you have the balance). Splashdown Grand Turk is a 3,500-square-foot attraction that celebrates the unique relationship of the American spaceflight mission and its importance to Grand Turk's history with interactive exhibits and authentic spacecraft replicas. Turks & Caicos National Museum. The Museum is housed in the beautiful Guinep House, an 1800’s grand home along Front Street. The second floor balcony overlooks the Atlantic Ocean, and is a prime place for whale watching during February and March! Please keep in mind that if more than one cruise ship is docked here, things can get very hectic. A taxi across the island is about 10 USD. If you want to rent a golf cart, do so at least 2 months before you cruise starts. It's a fun way to discover the island. There's no public transport on Grand Turk. Grand Turk Lighthouse. The only lighthouse in the country, this beautiful (albeit not very large) structure is the main historical attraction on Grand Turk. Don’t miss out on the scenic coastal path that leads along the cliffs north of the lighthouse. Unfortunately, access is not allowed inside. There is a duty-free mall right at the cruise-ship center, where you’ll find the usual array of upscale shops, including Ron Jon’s Surf Shop, the largest Margaritaville in the world, and Piranha Joe’s. There are also shops in Cockburn Town. The U.S. dollar is the official currency and there are several banks with ATMs on the island. The island's first language is English although you'll hear certain phrases that vary from English and unique proverbs and terms which lend a distinctly Turks & Caicos flavor to the spoken word.